Welcome to the Bearded Dragon Decor superstore! Bearded dragons have long been one of the most commonly kept reptile pets due to their calm demeanors and relative ease of care, but they originated in the harsh, arid wilds of Australia. Recreating the bearded dragon's natural habitat is important in order to bring out and encourage its natural behaviors and activities, and to encourage the liveliness that all pet owners love to see. Providing your "beardie" with rocky caves will help relieve stress, and plenty of natural climbing materials will provide exercise and stimulation. Pet Mountain's Bearded Dragon Decor store features top quality products from the most trusted names in pet reptile care and terrarium habitats, including Hagen Exo-Terra, Zoo Med and Zilla. 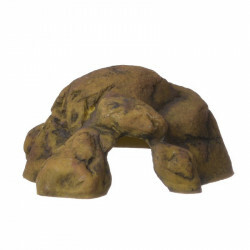 The Exo Terra Reptile Cave features a natural look that integrates into any type of terrarium. It is easy to clean, provides a secure hiding place, prevents stress, is very stable, and is not easily tipped over by larger reptiles. Use Zoo Med Natural Mopani Wood for Terrariums to transform your terrarium or aquarium into a natural wilderness. Great for climbing on, crawling over, slithering through and hiding under, this beautiful, unique African hardwood makes a great addition to any habitat. This authentic African hardwood has been sandblasted for a smooth surface, textured detail, and unique mottled color. The Zilla Desert Series Rock Den provides your pet with a secure living space that also helps hinder the growth of bacteria. Its solid construction keeps the Desert Rock Den in place while enhancing the terrarium with a natural appearance.